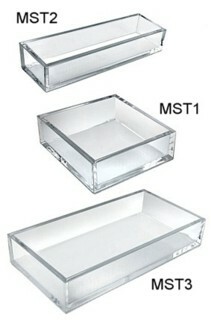 MST Tray Models are STACKABLE!!! Our Clear Molded Display Trays are Durable Sturdy Trays to Hold and Display Your Items. These High Quality Display Trays are Molded From Crystal Clear Styrene and Since They are Molded, They Are Seamless and Give Your Products the Upscale Attention They Deserve! 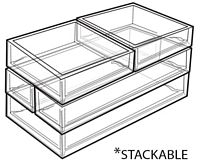 In Addition, The Molded Styrene Trays are Stackable For Even More Design Possibilities!